China Tariffs: This Company Likes Some Of Trump's Tariffs, But Not Others A textile firm's reliance on China for raw materials has put it in the middle of a growing trade war — and its view on President Trump's tariffs is rather unusual: It both opposes and supports them. 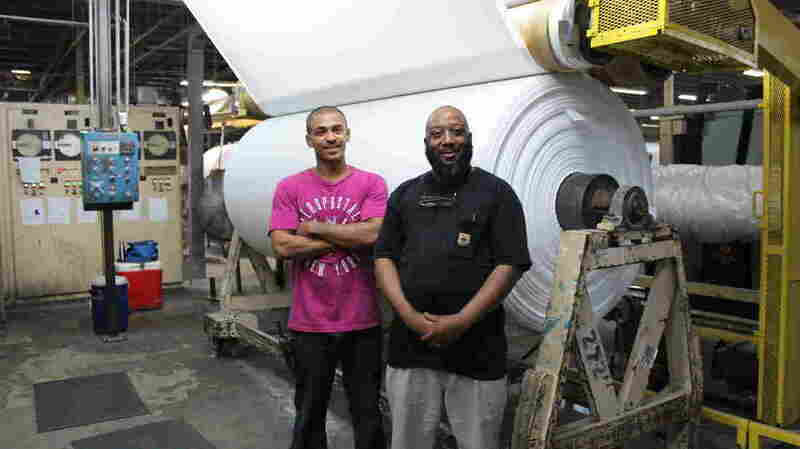 Rockland Industries employs about 240 people, including Kim Fisk (left) and Mitchell Sapp, who work at the textile company's manufacturing plant in Bamberg, S.C.
For weary travelers, hotel blackout curtains can be crucial for rest and relaxation. "It's a product you're familiar with it, but you never think much about," said Mark Berman, the CEO of Rockland Industries, a Baltimore-based textile company that's been manufacturing the fabrics since the 1960s. Back then, the Westin International hotel chain approached the company and asked it to make a drapery that would keep rooms dark. Over the decades since, Rockland has honed its technology and manufacturing process: Take woven fabrics, apply a proprietary coating that gives them a blackout quality, and sell them to hotels and retailers. The company has managed to keep the business going despite major changes in where it gets its raw materials. But now, Rockland's reliance on China for those materials has put it in the middle of a growing trade war — and its view on President Trump's tariffs is rather unusual: It both opposes and supports them. "Twenty-five years ago, there were over two dozen weaving mills in the U.S. making the woven textiles that we use as our raw materials. Now, we're down to just one mill," Berman said. The Chinese cheat and there's no question about it. Anything we develop, usually in about six months, we see the same products coming out of Chinese mills. "We absolutely must buy our raw materials in China because they are not sufficiently available in the U.S. or even in other countries," he said. Rockland's relationship with China isn't all good, though. Berman cited intellectual property theft as one of several challenges the company faces in dealing with that country. "The Chinese cheat and there's no question about it," he said. "Anything we develop, usually in about six months, we see the same products coming out of Chinese mills." Those dueling realities — that China is simultaneously a friend and a foe — is why Berman is both for and against the Trump administration's plan to levy more tariffs on China, this time of up to 25 percent on $200 billion of imports into the United States. On Friday, President Trump said those tariffs "could take place very soon" and he raised the possibility of tariffs on an additional $267 billion of imports from China. Many U.S. executives and trade experts have opposed using tariffs as a negotiating tool with China, but Berman doesn't see the issue in black and white. For him, tariffs could potentially be positive, depending on which items remain on the massive list of products the Office of the United States Trade Representative has said could be affected if the next round of tariffs on imports from China is implemented. Some of Rockland's raw materials — like certain woven fabrics and chemicals that make blackout fabrics fire-resistant — are included on the list. Tariffs are also proposed on finished fabric products made by Chinese companies that directly compete with Rockland's finished offerings in the U.S. market. Berman said it would be fair for tariffs to be imposed on the Chinese products, but not on Rockland's raw materials. He made this case during recent public hearings on the proposed tariffs. "Make no mistake about it: Not only Rockland's business, but its very existence is imperiled by unfair Chinese trade practices and the harm will cascade down the U.S. supply chain," Berman said. He said 25 percent tariffs on finished Chinese blackout fabrics would be "practicable and effective" in reducing unfair trade practices that burden and harm American companies in his industry. Such a perspective echoes sentiments Trump offered as his administration levied duties on $50 billion in imports from China this summer. The president has argued that aggressive tariffs will force China to modify unfair trade practices and negotiate trade arrangements that are more beneficial to American firms. However, Berman said that any benefits of using duties on his Chinese competitors would be nullified if tariffs were also implemented on the raw materials. "The imposition of additional duties on the raw materials and chemicals used by Rockland will exacerbate the injury inflicted by China's unfair practices and will cause disproportionate economic harm to Rockland," Berman said during the hearing. Rockland already pays tariffs ranging from 5 percent to 15 percent on some of the raw materials it imports from China, and Berman predicted any additional duties would be devastating to the company. "I would think that we will lose business to the Chinese competitors here in the U.S. and what I can see is that if our sales go down, there could be layoffs in our company," he said. Rockland employs 240 people, mainly at its manufacturing plant in Bamberg, S.C. Still, Berman was not wholly opposed to the Trump administration using tariffs as a tool. "If we could put the tariff on the finished product coming from China — not the raw materials that we can't get from anywhere else — that would increase manufacturing here in the U.S. and our market share," Berman said. But some trade experts have warned about the hazards of using tariffs as a negotiating tactic in any capacity. The U.S. Chamber of Commerce has said tariffs pose a threat to the American economy and the group advocated for using other methods — like direct negotiations — to encourage fairer trade with China. China has already retaliated against the United States for implementing tariffs, and says it's prepared to strike back again if further duties are imposed. 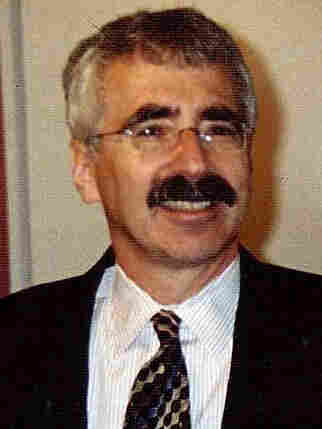 Jeffrey Frankel, a professor and economist at Harvard University, said some concerns American companies have raised about China are valid. However, he said looking to tariffs as a solution is generally unwise because of the amount of imported materials American companies rely on and supply chains that crisscross borders. "There are an awful lot of companies for whom the tariff war is bad news and there are some for whom it's good news in the short run," Frankel said. "For a company where the pros and cons are sufficiently balanced, it will depend on which products are hit." Berman said he hoped his testimony would result in a favorable outcome for the company, although he wasn't necessarily optimistic. "There are so many people with so many different interests," he said. "As a practical matter, I don't see how the United States Trade Representative's office can deal with all of this effectively."